North Korean leader Kim Jong Un met with a delegation of South Korean special envoys on Wednesday in Pyongyang and received a letter from President Moon Jae-in, the Blue House announced on the same day. The special presidential delegation, led by the head of the presidential National Security Office (NSO) Chung Eui-yong, was making a one-day trip to Pyongyang. The DPRK leader and South Korean delegation “exchanged opinions,” presidential spokesperson Kim Eui-keum said in a written statement. The statement, however, contained no further details about the substance of the discussions. After landing in Pyongyang at 0900 local time, the special envoys briefly met the chairman of the DPRK’s Committee for the Peaceful Reunification of the Country (CPRC) Ri Son Gwon and vice-chairman of the Central Committee of the Workers’ Party of Korea (WPK) Kim Yong Chol at the Koryo Hotel. While a meeting with the North Korean leader had not been confirmed prior to the trip, Seoul had previously said that both sides were expected to discuss various issues including the improvement of inter-Korean relations, denuclearization and the establishment of permanent peace on the Korean peninsula. Wednesday’s visit was also expected to see the two Koreas discuss the specific schedule and agenda for the upcoming third summit between Moon and Kim, which is scheduled for September. Both sides agreed to hold what will be the fifth inter-Korean summit in history during a high-level inter-Korean meeting at Panmunjom in August. The summit is set to take place in Pyongyang, though no specific dates have been publicly announced. The five special envoys are scheduled to depart Pyongyang for Seoul after a banquet, with a subsequent press briefing on the trip expected to be held on Thursday, according to the Blue House. Director of the National Intelligence Service (NIS) Suh Hoon, Vice-Minister of Unification Chun Hae-sung, second deputy director of the NIS Kim Sang-gyun, and Director of the Government situation room at the Blue House Youn Kun-young made up the other four positions in the delegation. 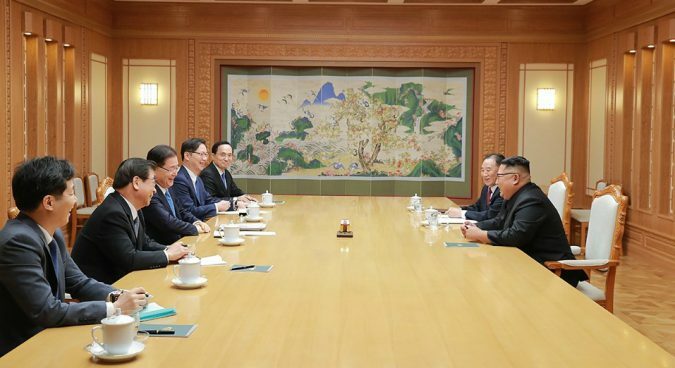 In March, director of the United Front Department of WPK Central Committee Kim Yong Chol and first vice department director of the WPK Central Committee Kim Yo Jong accompanied the North Korean leader at the meeting with South Korean special envoys held at the WPK headquarters. The ROK delegation then returned to the South, announcing major results including Kim’s willingness to denuclearize in exchange for guarantees of regime security and the establishment of a communication hotline between the two leaders. Subscribe to read the remaining 469 words of this article.